There's an on-again off-again update for the Motorola Q smartphone that has made a quick appearance on Motorola's site and then mysteriously disappeared. A glance at the Motorola update site shows that it's back to tease mode, telling us this software update is "coming soon." Wonder what happened? 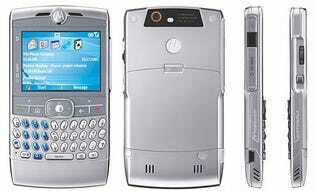 Anyway, it looks like Mot plans a few added capabilities, with highlights being the ability to use the Q as a modem with added dial-up networking functionality, some OS enhancements for Microsoft Windows Mobile 5.0, and the ability to access websites that support frames. Get the full wonky details of the update after the jump. 1. Dial-Up Networking (DUN) - Q can now be used as a modem - either tethered or via Bluetooth to the PC. 2. Multiple NAI - Allows handset to be enabled for modem use on the network. 1. Provides users the ability to master reset device using key-presses if device becomes locked after forgetting Device Lock password. 1. Enable Q to access network via different proxies (corporate IT feature). 3. Allows Q to access websites that support frames which increases the variety of websites that a user can visit.